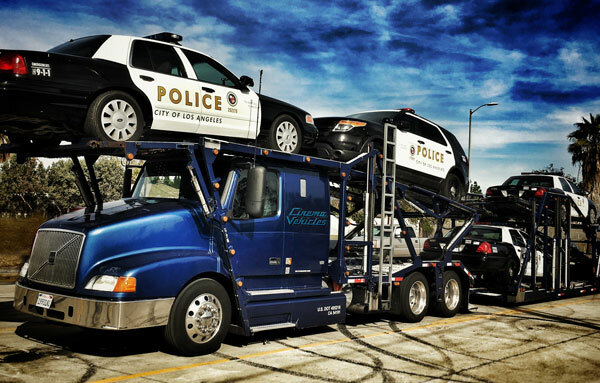 Need help moving your fleet of cars to the set? Cinema Vehicles can handle all your movie vehicle shipping needs. We’ll get your vehicles to the set quickly and safely, so you can start shooting your car chases and crash sequences on day one. We’ve got you covered from delivery to drop off. Our company is fully bonded and insured, so your vehicles are guaranteed to arrive safely. Our in-house transportation department offers a variety of car carriers, beaver tails, flatbeds, and transport vehicles, so you can find the movie car transportation option that fits your needs. Whether you are looking for a local delivery, or want to send a set of cars across the country Cinema Vehicles can manage all of your movie car transportation needs. With facilities in Los Angeles, New Mexico, New Orleans, and Atlanta, we have the infrastructure in place to transport your vehicles anywhere in the country quickly and affordably. Shooting internationally? Our logistics team is dedicated to providing seamless transportation services for all of your movie vehicle shipping needs, across borders and throughout the globe. We have the resources and experience necessary to bring your picture cars to the set — no matter where in the world your production takes you. Since 1975, Cinema Vehicles has been building its reputation throughout Hollywood as the largest and most reliable picture car company in the industry. Over the years, we’ve expanded our family-run business to include the most dependable movie vehicle shipping in the world. Contact us today to learn more about our movie car transportation services. Local and long haul services available. Contact us or give us a call @ 818-780-6272, we will be happy to fulfill your production needs!